You had one job. ONE JOB. Fixing the broken dream of the single responsibility principle. 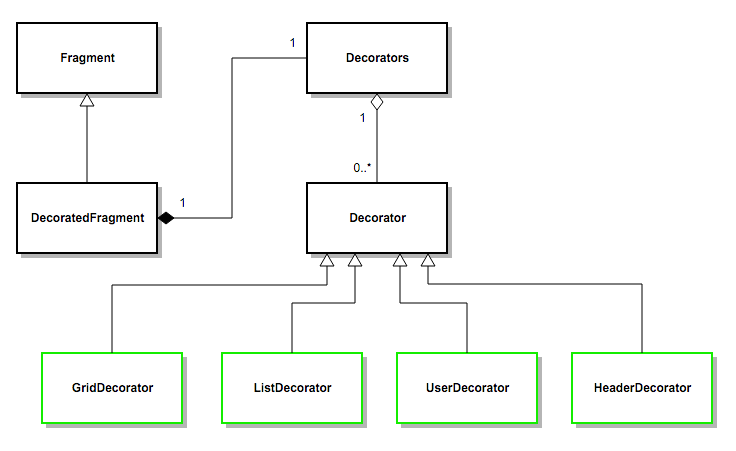 The idea behind the decorator pattern is to decouple responsibilities from the parent class into reusable components. Individual decorators can then be attached to otherwise empty parent classes to do a single job. This allows a simple java class to have multiple and dynamic inheritance. In order to make this pattern scalable with minimal boilerplate, an easy to use code-generation library was created to automate most of its creation. Additionally, there are other UI building parts coming from product/design decisions and these can vary dramatically and dynamically. As developers we address this either by defining some extra flags or by extending base classes to cover for new functionalities. Flags usually lead to a source code with huge amount of if cases with custom behaviors during several points of the life-cycle. The bigger the number of the flags the more permutations you get and the more messy your code gets. 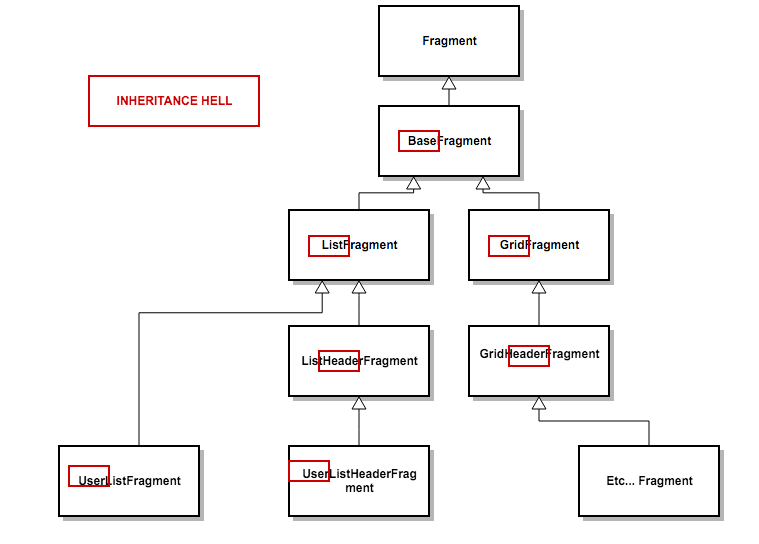 Inheritance is a base concept of object oriented programming and a common practice of getting things done on Android. You pretty much override everything constantly (View, Application, Activity, Fragment etc.). Contrary to flags approach, extending class can help you avoid multiple ‘if’ cases but can also turn very quickly into “inheritance hell”. The idea behind decorators pattern is to decouple responsibilities/features from the base class and never inherit from the base class anymore. If you need to extend a base class you lose. Decorator class with empty methods. These methods come from the base class. Decorator acts much like observer on steroids. This is the class you extend in order to add your features. Decorators class with a list/map/array of Decorator that dispatches all the callbacks and optional callbacks to the Decorator list in a for-loop. Decorated class that extends from the base class. It contains and initialises a Decorators object and dispatches its original callbacks to it. Instigators class that is a special case of decorator. It produces some object e.g. adapter instance and it can’t be put together with another instigator of the same time. Example: The base class only requires one adapter and we can’t have two or more decorators providing different adapters as this would lead to ambiguity. Dynamic and runtime permutations of features that are added to the base class. Future proof - if your base class is Fragment and you want to switch to a Presenter, you instantly see the scope of migration (all the decorators to be rewritten) and will come up with a migration plan faster. Development parallelization - because features are separated per class, it’s easy to add new ones without interfering much with other developers. As complex as it might sound, it’s actually pretty easy to build a very flexible structure with that approach. Let’s illustrate here a decorated activity. First we create a template code for the annotation processor, this class can be ProGuard`ed later on, that’s only a blueprint and it’s not needed for the final .apk. This will generate 3 classes, Decorator.java, DecoratedActivity.java (extends from AppCompatActivity) and Decorators.java. Then, we create our MainActivity from the generated DecoratedActivity class. That’s the absolutely base and it’s not doing much at all. Let’s code for this example an UI with a RecyclerView showing data from some GET photos request and using a local data storage from Potato Library. First we’ll add a few extra callbacks to our Blueprint class. Instantiates a simple RecyclerView layout. // use data from the Intent to generate list name for the requested data.